Nokia (It was still Nokia then) launched the Nokia X, Nokia X+ and Nokia XL at Mobile World Congress earlier in the year and they had a message to both consumers and critics. They were here to take a share of Android, but were not yielding to Google, not at any cost. Now as we all know, Nokia X runs on the Android Open Source Project, same Operating System that powers the Kindle Fire HD by Amazon. What’s common between the two is the difference they have from the vanilla Android that Google releases to OEMs to power Android smartphones. The latter comes with prominence for Google services, and if you have noted, the devices running Kitkat version of Android, Android 4.4 have a Google folder on the home-screen. I thought it was a Samsung thing, till I saw it on all other phones running Kitkat, same thing with the Android logo at boot screen even if you added a skin onto Android. Back to Nokia X series. These devices are different in that they have no Google backing and have no access to the Play Store, even with the explicit message by Microsoft Devices Group that “You have access to third party stores with Nokia X”. Google is the evil one, they want nothing of it. Of course that’s a compromise right there as Google has with time worked out better ways and partnerships to bring the best to Android. What has Microsoft Devices Group brought in instead? They have alternatives from Microsoft, this includes Skype instead of Google talk, Nokia Store, People App instead of the usual contacts app, Nokia Browser for Google’s Chrome, Nokia Music app for Google Music app, Here Maps for Google maps and other things Nokia. Things have not been quite smooth after that change and you will feel the absence of apps like hangouts and Google Now which basically won’t work unless you root the device (of course very much discouraged, you can tell this by the way Nokia was quite eager to patch the ability to root the device). Even some app launchers like GoLauncher won’t really work well as Getjar, another third party app store where you would find the launchers not on Play Store requires your Google account to function. Microsoft Devices Group (I will go on using Nokia for the rest of the mentions here, it’s a bit confusing still) knows this and continues improving the experience of the alternatives, they won’t give in. Why not just allow Google services? Nokia is quite clear, and as the boss Stephen Elop mentioned at some previous AMA (ask me anything), Nokia X platform is a new way to get the next billion mobile users of Microsoft services. If you know Steve, you know he won’t relent (Okay, he once said Nokia won’t be going Android, but you get the drift) on the quest to get the experience up-to par with Android by Google or better. Nokia East Africa Managing Director Bruce Howe mentioned at a previous event that Skype is the platform being pushed as a primary chat application by Nokia. You know, we think Skype and just think video chat, and that’s why it didn’t yet make sense to push it’s awesomeness on Nokia X without a front camera. Nokia wants to tell you that you need to think of it as a WhatsApp alternative. You know, when you set up your Microsoft account on a new device, the Skype contacts remain, just like if you move WhatsApp to a new phone and access contacts who use the service. So if you are going to use Nokia X, learn to love Skype, HERE maps and Bing among others. At least the browser allows you a choice of browser from Bing, Google and Yahoo as shortcuts in the browser. Microsoft fully has Nokia’s back in the X project, so just as they have been working with them for development of the Windows environment, they are working on Nokia X platform to get it the best experience. Afterall they won’t be cultivating the enemy’s farm by doing so. Soon Nokia will be announcing he second version of the X platform device and I expect this to come with new ways to do things. The X has been getting a lot of updates and Nokia is working it’s toenails off to ensure they won’t need Google on this one. 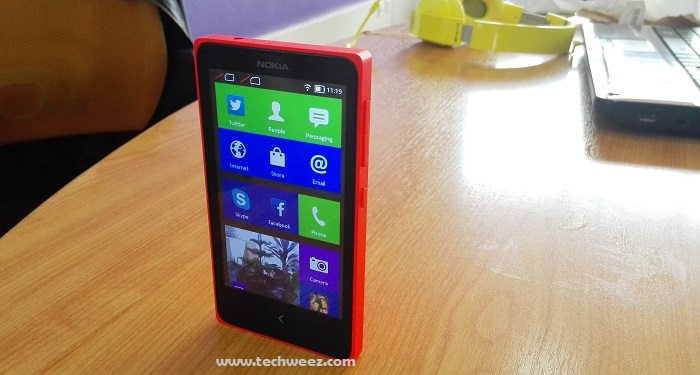 Nokia will perfect the Nokia X with time. You don’t have google chat and other google products on Windows phone or Asha, Nokia wants to maintain that and make their OS different.